Did any go to the MTA (MABSTOA)? What about any other NYC-area carriers? New York Bus Service had ordered them through 1982. Jamaica Bus, Triboro Coach and Green Bus Lines had them as well. Back in the day, I am sure I saw these Canadian coaches and had no idea whatsoever that they were actually "non domestic"! When domestic New Look production ended in 1977, many US operators who were loyal to GM now looked to Canada to purchase New Looks. I would have LOVED to have seen an articulated New Look with the original 1959/1960-era "nose".......WOW!!!!!!!!! GM's New Look was indeed a true American Success Story......like the earlier Old Looks, the stylish and modernistic New Look truly became a "classic American b us".......they seemed to be everywhere, starting in the 60's and through the 80's and into the 90's. "GM's New Look Bus" (McKane/Squier) is indeed, IMHO, the BEST publication out their on the New Looks. I make my way up to NYC every December to ride the classic New Looks on 42nd St. It's great fun for a day. You are indeed a man with EXCEPTIONAL taste!!!!! The last GM New Look I rode was back in 1997; this now-classic coach was an ex-Cleveland unit, repainted and renumbered #B-118, and ran on the old NHBL #1, between Journal Square and Nungessers. Those buses were built like TANKS and indeed gave good, solid, reliable service ever since they debuted so many decades ago. Sure hope you can snap a pic showing this Classic All American Workhorse! What was the bus doing there? Sure hope to see this old relic! 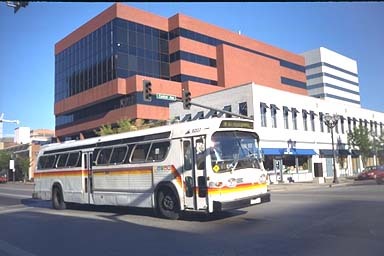 Bi-State Transit in St. Louis (now MetroBus) was a big purchaser of Canadian new looks buying their first batch in 1978. One of the unusual features was the elimination of the half-moon window behind the front door. Santa Monica was another transit company purchasing Canadian new looks sans the half-moon window. Appreciate you sharing it here......man, do I miss New (and Old) Looks!! Not surprising in the least that some American companies chose to buy Canadian New Looks when American production ceased. Since the earliest New Looks hit the streets in 1959 (almost 60 years ago!!) these buses have more than proven themselves as true workhorses, bucking just about anything you could throw in their paths. IMHO, both the Old Look and New Look were the BEST American transit buses ever to hit the streets........where have all the years gone......? ?